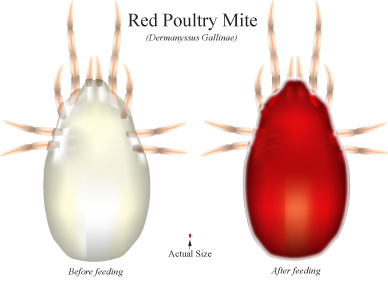 The poultry red mite, not to be confused with the red spider mite encountered by gardeners, is the scourge of chicken keepers countrywide. They are tiny (up to 1mm) slow moving mites that will take up residence in any available nook, cranny, crack or gap in your hen house. Favourite haunts are the ends of perches where they meet the inside edge of the coop, the gap underneath the perch support, gaps between the window and the sill, any joins or cracks in the ceiling or between boards and, a particular favourite, underneath roofing felt. 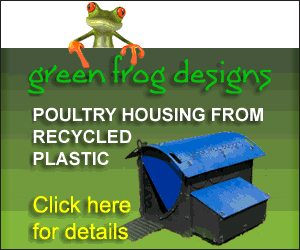 They will also colonise nest boxes so broody hens become an easy target for them. They are a true arachnid and are known as a ‘temporary parasite’ because they only feed off their hosts and do not live on them. They feed by sucking a chicken’s blood dropping off after 1–2 hours. They range in colour from a very light grey, almost translucent, to a light brown and blood red after they have had a feed. Their eggs are harder to spot but are around 0.4mm x 0.25mm and a translucent white colour. Their life cycle is rapid; from hatching to adulthood takes only 7 days. Within 24 hours a female will be capable of laying copious amounts of eggs which, under warm conditions, hatch in 2-3 days, four days later these youngsters have matured and are ready to lay their own eggs and so the cycle continues. Signs that you might have red mite in the coop are a reduction in egg laying, blood streaks on eggshells, pale egg yolks, chickens reluctant to go into the coop at night and pale comb and wattles due to anaemia. They are largely nocturnal so to confirm if you have red mites in residence go to the coop at night armed with some kitchen roll and a torch. Rub along the underside of the perch with the kitchen roll and if it has blood smears on it, you have red mite. You can also check the chickens at this time by parting their feathers. If there are red mite present you will see them crawl for cover. It is only in fairly recent years that red mite have become the major problem that they are. This is thought to be because it was until recently common practice for farmers and chicken keepers to give their coops and sheds an annual soaking with Creosote. Not only did this act as a preserver for the wood but it either killed the red mite or prevented it from taking up residence. The old fashioned creosote was banned in 2003 and can now only be bought by professionals. The present form of creosote, called Creocote, can be used but feedback suggests it is not really effective. There are proprietary chemicals available to prevent/kill red mite. These are available in liquid or powder form. If you decide to use the liquid then it is best the coop is treated in weather warm enough to dry out the coop before the hens can be allowed back into it. Powders can be used any time and some of these products can be applied to the chickens themselves, as well as their bedding and nesting materials or in to the chickens’ dust baths. This way they get the powder onto all parts of their body and retain some in their feathers. By using a puffer the powder can also be applied to the more inaccessible areas inside the coop too. Tea tree, peppermint, eucalyptus (crush fresh eucalyptus leaves and use in bedding and nesting), garlic or garlic oil, soya bean oils or cedarwood oils can also be used as effective natural deterrents. Eucalyptus and garlic are by far the most effective and garlic has health benefits as well. When given to the chickens in their water or added to feed the red mites dislike the aroma and flavour when they feed on the chickens. Of course there are other ways you can experiment with, for example pressure washers, blow torches (not highly recommended!) and double-sided sticky tape all being employed in the fight against these irksome bloodsuckers. Plastic coops also go some way towards alleviating the problem as mites are much less likely to colonise these unless you use a wooden perch inside. They are also very much easier to clean if you do get and infestation. For those of you that prefer a wooden coop however, as long as you follow a regular and thorough cleaning regime and avoid a design that uses roofing felt in its construction you should be able to stay on top of the problem. The key is to be vigilant and act quickly if the tell-tale signs appear. TOP TIP: Make a home made trap out of rolled up corrugated cardboard. Place out of the chickens’ reach in the coop and the mites will hide inside during the day; a quick tap of the roll will dislodge some to confirm their presence and you can then simply put the cardboard roll on your bonfire. I paint neat jeyes fluid on my nest boxes and perches leave it to dry in the sun and have not had a mite problem since. I have had successby wrapping flea collars sold for dogs/cats around the perches. The mites can only get at the birds by crossing the colar. That’s a new one on me an sound like an ingenious idea. I love to hear about and share all the methods people have found to control these pests, thank you Richard for yours.